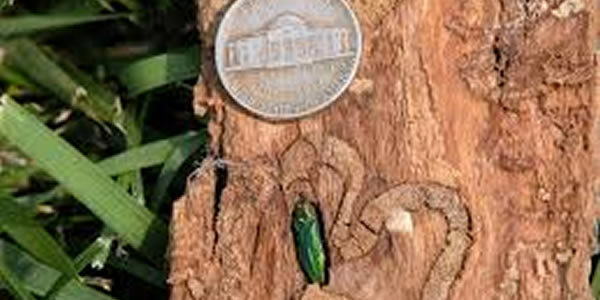 The Emerald Ash Borer was discovered in Michigan almost 12 years ago. Since then, it has made its way east, covering the western 2/3 of Pennsylvania. When this pest finally reaches Bucks County, it will be devastating to Ash trees in wilderness areas and residential landscapes throughout Bucks County. Native to China, the Emerald Ash Borer most likely made its way to North America in wooden shipping crates and pallets. Traps have been installed throughout the Doylestown area to detect the arrival of the Emerald Ash Borer to Bucks County. Bayer Advanced Garden Tree and Shrub Insect Control (Imidacloprid) is one option for treatment of infested trees. The infestation must be diagnosed early for the treatment to be effective, otherwise, removal of the tree is necessary. At this time, we do not recommend planting any species of Ash trees.